Great photos are one of the most sound investments your company can make. 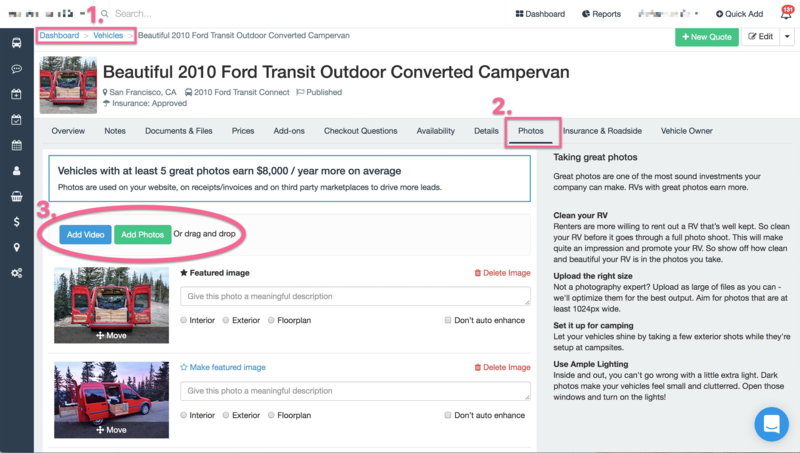 RVs with great photos earn more. Renters are more willing to rent out a RV that’s well kept. Clean your RV before it goes through a full photo shoot. This will make quite an impression and promote your RV. Show off how clean and beautiful your RV is in the photos you take. Not a photography expert? Upload as large of files as you can - we'll optimize them for the best output. Aim for photos that are at least 1024px wide. Let your vehicles shine by taking a few exterior shots while they're setup at campsites. Inside and out, you can't go wrong with a little extra light. Dark photos make your vehicles feel small and cluttered. Open those windows and turn on the lights!